The detection system must provide a visual indication to the flight crew within 1 minute after the start of a fire. The system must be capable of detecting a fire at a temperature significantly below that at which the structural integrity of the airplane is substantially decreased. There must be means to allow the crew to check, in flight, the functioning of each fire detector circuit. A Class A cargo or baggage compartment, is one in which the presence of a fire would be easily discovered by a crewmember while at his or her station and each part of the compartment is easily accessible in flight. A Class B cargo, or baggage compartment, is one in which there is sufficient access in flight to enable a crewmember to effectively reach any part of the compartment with the contents of a hand fire extinguisher. When the access provisions are being used, no hazardous quantity of smoke, flames, or extinguishing agent enters any compartment occupied by the crew or passengers. There is a separate approved smoke detector or fire detector system to give warning at the pilot or flight engineer station. There is a separate approved smoke detector or fire detector system to give warning at the pilot or flight engineer station. There is an approved built-in fire extinguishing or suppression system controllable from the cockpit. There are means to exclude hazardous quantities of smoke, flames, or extinguishing agent from any compartment occupied by the crew or passengers. There are means to control ventilation and drafts within the compartment so that the extinguishing agent used can control any fire that may start within the compartment. There is a separate approved smoke or fire detector system to give warning at the pilot or flight engineer station. The controls for shutting off the ventilating airflow to, or within, the compartment are accessible to the flight crew in the crew compartment. There are means to exclude hazardous quantities of smoke, flames, or noxious gases from the flight crew compartment. The optical smoke detector consists of source light emitting diodes (LEDs), intensity monitor photodiodes, and scatter detector photodiodes. Inside the smoke detection chamber, air flows between a source (LED) and a scatter detector photodiode. Usually, only a small amount of light from the LED gets to the scatter detector. If the air has smoke in it, the smoke particles reflect more light on the scatter detector. This causes an alarm signal. The intensity monitor photodiode makes sure that the source LED is on and keeps the output of the source LED constant. This configuration also finds contamination of the LED and photodiodes. A defective diode, or contamination, causes the detector to change to the other set of diodes. The detector sends a fault message. 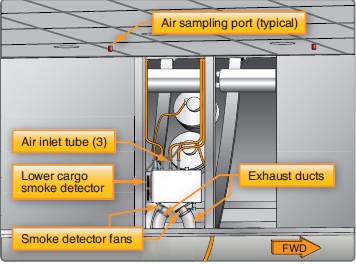 The cargo compartment extinguishing system is activated by the flight crew if the smoke detectors detect smoke in the cargo compartment. Some aircraft are outfitted with two types of fire extinguisher containers. 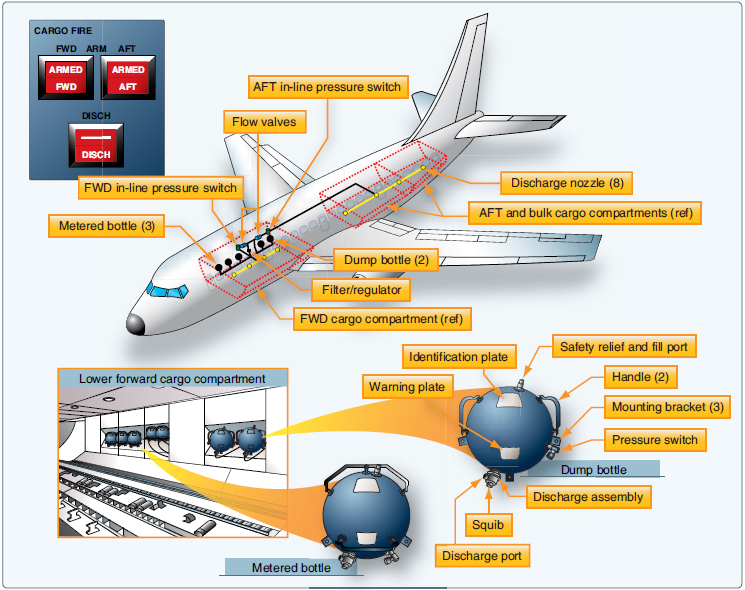 The first system is the dump system that releases the extinguishing agent directly when the cargo fire discharge switch is activated. This action extinguishes the fire. The second system is the metered system. After a time delay, the metered bottles discharge slowly and at a controlled rate through the filter regulator. Halon from the metered bottles replaces the extinguishing agent leakage. This keeps the correct concentration of extinguishing agent in the cargo compartment to keep the fire extinguished for 180 minutes. The fire extinguishing bottles contain Halon 1301 or equivalent fire extinguishing agent pressurized with nitrogen. Tubing connects the bottles to discharge nozzles in the cargo compartment ceilings. Master warning lights come on. A cargo fire warning message shows. Cargo fire warning light comes on. The master warning lights and fire warning aural are prevented from operating during part of the takeoff operation.